Donald Park has confirmed he is leaving his post as Hibernian assistant manager to become head of coach education with the Scottish Football Association. The former Hearts player will begin his new role during the close season. "I have had a wonderful time at Hibernian and have a great relationship with the manager (Mixu Paatelainen)," Park told the Hibernian website. "I am truly sorry to be leaving him, the coaching staff, players and a fantastic training centre." Paatelainen added: "I would like to thank Donald for his input throughout the last 18 months. "Donald is very enthusiastic and has helped coaches and players alike. "Everyone would like to wish Donald well for the new challenge he faces. I have no hesitation in saying he will do a good job for the SFA." 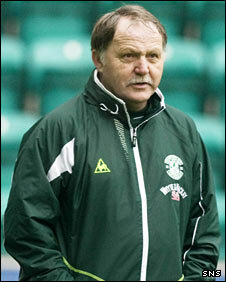 Park began a second coaching spell at Hibs when he joined Paatelainen's backroom staff in 2007, having previously worked with Meadowbank Thistle, Inverness, Hearts, Arbroath and Raith Rovers. "Anyone who knows me well knows of my love for the game and my passion for education within the game," added Park. "The offer to take charge of the national coaching programme for coaches was very hard to turn down."